It's "Tips and Tricks" day in the Babywise Friendly Blog Network and our topic is Emergency Preparedness. I racked my brain trying to find something (anything!) to post about. If you look on our Emergency Preparedness Pinterest board, you'll notice a lot of interesting and helpful things - uses for duct tape, foods that last forever, budget tips, 72 hour kits, etc. These are all very useful, practical, and necessary pieces of information. I legitimately have nothing to contribute of that nature, so bear with me. I decided I'd write about clothes. I know, fashion is something I'm soo well-versed in, but this post is mostly for me. Sometimes fashion can be an emergency. Not a real life emergency with actual stress, but an Alicia-Silverstone-in-Clueless kind of emergency. An I-have-to-leave-in-10-minutes-and-I-have-no-idea-what-to-wear emergency. This has been so hard for me lately, mostly because I'm not quite back to my pre-baby body so getting dressed is annoying, frustrating, and it takes forever. I'm all about wearing t-shirts, but every once and a while, it's nice to know you can still look decent. 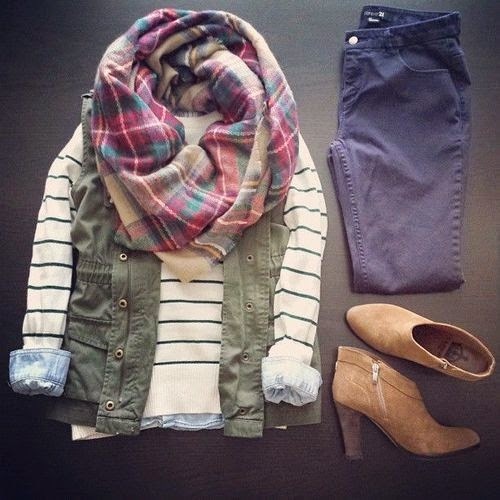 So, I looked through some of my pins on my style board and picked a few fall outfits. These are basic outfits with very basic pieces that I could mimic. Maybe if I could keep these ideas in mind, I wouldn't stand in front of my closet for 20 minutes, thumbing through my clothes. A white tee, striped shirts/sweaters, denim/patterned button down shirts, jeans/pants, scarves, a blazer - simple items and simple outfits. What are your go-to items/outfits when you're in a crunch? Follow the Babywise Friendly Blog Network Pinterest page for more Tips and Tricks! I was never much of a scarf girl but I have definitely changed my mind over the past year! 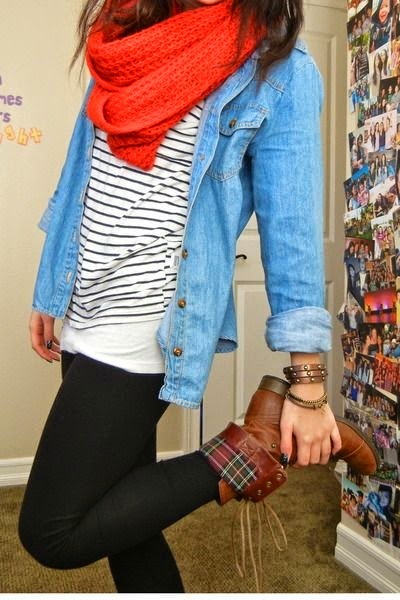 A scarf can "finish" any outfit... t-shirt, skinny jeans or leggings and a scarf. Done! Nice information regarding the emergency outfit, but suppose a person love to wear 100% pashmina Scarf due to the winter, but didn't have it, What to do?